These rimmed made to measure shower trays can be custom made to your specific dimensions. All outer tray dimensions can be specified allowing for the bespoke tray to fit into unusual and odd shaped spaces within your bathroom. These made to measure trays are available in 6 colour choices and 2 x anti-slip textured finishes both with a thickness of only 45mm. All our bespoke shower trays are priced by quotation. All that is required to price, is a drawing (hand sketched will do) with the shower tray dimensions on. This is then emailed to Livinghouse via the email link below. We will then price to these drawings hopefully within a day, if not quicker. Prior to the manufacture, we will supply a scaled drawing for the customer to re-check and confirm their measurements. * Made in textured rigid silicon resin. * 2 x "Sure Foot" anti slip finishes. 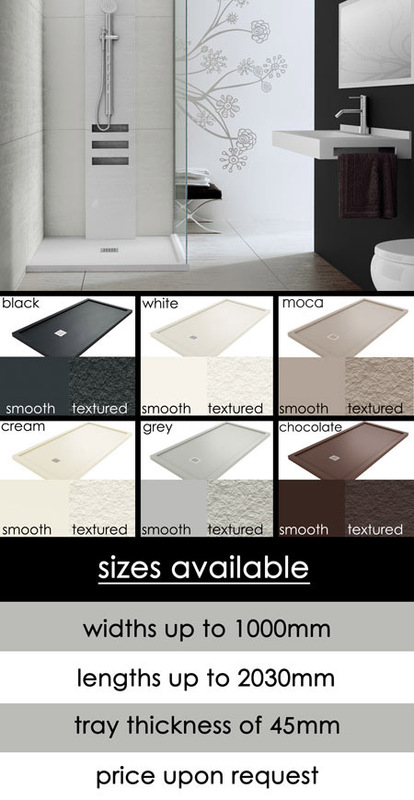 * Bespoke shower trays only 45mm. * Delivery approx. 4 weeks.